Les Johnson nails it for a great set of recorded handcalls based on the sound sequencing and file format. 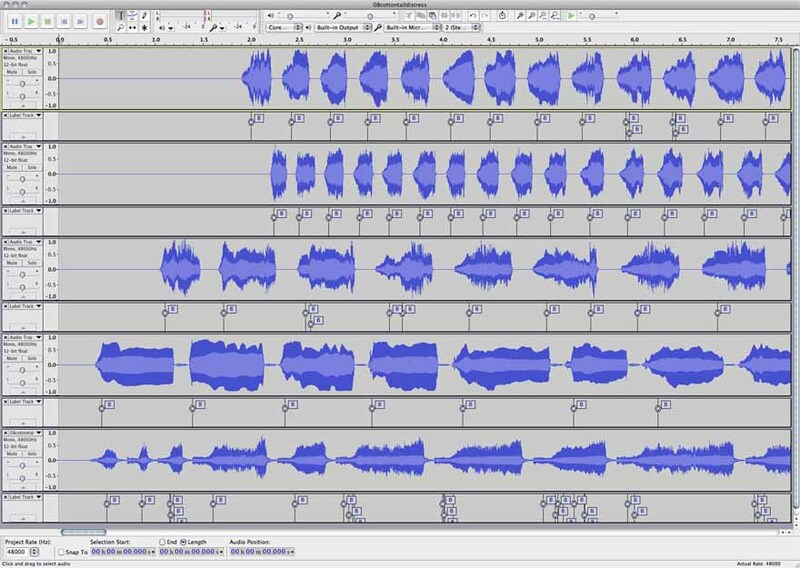 The timeline is well edited into snippets of sound spaced by pauses. Another set and pause. Another and pause. Finally, he squeezes it into a small file so it's both fast and easy to email or download. These demo and practice sounds are easily shared. Looking closer at this soundlist in general, it's easy to see the technical reasons why they are better for practice than hunting. All but one of the files are lo-fi. I can think of no good reason why these aren't standardized to 128MBps and 44.1KHz, at least as good as ipod music in a noisy car. Better would be something at 256 or 320, so file compression is not the weakest link in the signal chain. However, those files would be considerably bigger and harder to email. Additionally, files like this leave no overhead for editing, which is a technical point aimed at those who actually edit. Finally, looking at just the cottontail file, there should/could have been another quiet section at the loop, short sections of silence at the start and finish. That was a rookie mistake that affects the file's utility and was probably inadvertant. Leaving it out further shrinks the file size if it were intentional. At some point file size, storage space, and transmission speed should take a back seat to fidelity. Four well known live recordings & Les's cottontail are shown below. The Picture shows some interesting mathematical beat analysis results under the sounds. Check out the regular rhythm that runs under the live animal sounds. The hand call is bit more amorphous and for the large part lacks similar timing features. The animal files also have a clearly defined structure with a visible inhale cycle. Lightning jack actually has an inhale wheeze. The hand call attempts to mimic those generally silent sections with a lessened amplitude, but Les apparently never stops blowing the call completely. It's obvious from the spectrogram that this sound was generated by a large-lunged animal starting and stopping and not a small rodent inhaling and screaming. Hand calls are always a curiosity to me. They are after all is said and done, a man blowing a whistle. There are at least two schools of hand calling. The first is the group who believes that the sound should mimic a live animal. The second broadcasts loud noise which evokes curiousity without much similarity to any live animal. Les's cottontail file may call a coyote. It may even win a call contest. However, if the goal of this sound were to mimic a live distressed cottontail based on timing and structure, it has room for serious improvement.